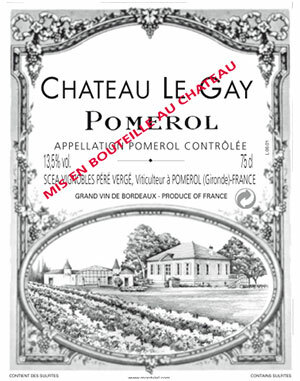 Tasted at the château, the 2006 Le Gay has an intriguing, attractive bouquet with secondary aromas of truffle and dried blood, an almost ferrous verging on animally aroma that renders it a little rustic compared to other vintages. The palate is medium-bodied with grainy tannin, savory in the mouth with a touch of bacon fat infusing the red fruit, just a touch of dryness perhaps on the finish, but this is still a great Le Gay that has the structure to suggest it will give another 15 years of pleasure. It will not improve further, but it will hold strong for a few years yet. Tasted March 2016. Drink 2016-2026. This has lots of new wood, with ripe fruit and hints of coffee and dark fruits. Full-bodied, with well-integrated tannins and a slightly chewy finish. Needs time. Much better than from barrel. Best after 2013. Medium ruby-red. Dark berries, chocolate and a hint of menthol on the nose. Lush, broad, ripe and sweet; a very smooth, fine-grained young 2006 that finishes with suave tannins and subtle rising length.